Here's Everything You Want To Know About Apple I Phone X. Home > Social Information > Business > Here’s Everything You Want To Know About Apple I Phone X.
Cook said the new iPhone was “the biggest leap forward since the original iPhone.” It’s not pronounced iPhone X, by the way — it’s the iPhone “10,” and the screen takes up the whole of the phone’s front panel. It’s made from surgical-grade stainless steel, with glass on the rear panel. It’s water and dust resistant, and available in space grey and silver. Our iPhone X hands-on reveals how impressed we were with the phone, but it’s unclear why no other company made the iPhone X before Apple. Little of its tech is new, after all — here’s a list showing which phones originated some of its innovations. The OLED display — the first in an iPhone — is called the Super Retina Display and measures 5.8 inches, with a resolution of 2,436 × 1,125 pixels. Apple says it has cured problems with brightness and color accuracy that sometimes plagued OLED screens in the past, and has added Dolby Vision and HDR10 support for stunning video playback. It also features TrueTone dynamic white-balance adjustment, a feature also seen on the 10.5-inch iPad Pro, and the new iPhone 8 models. Rumors put the iPhone X’s price at $1,000, and that turned out to be correct. It will be available in either 64GB or 256GB configurations and will be available to pre-order on October 27, with deliveries beginning on November 3. The good news is that Apple will sell the iPhone X in 55 countries around the world. But those dates could change. According to Christopher Caso, a chip analyst with Raymond James, assembly of the iPhone X isn’t set to start until mid-October, with production ramping up in the December quarter. And a report from KGI Securities estimates it could take well into 2018 for Apple to fill all iPhone X orders. The iPhone X was the third phone announced by Apple on September 12, joining the iPhone 8 and 8 Plus. It followed the Series 3 Apple Watch, which comes with built-in cellular connectivity. The event also featured other new devices. To unlock the iPhone X without a home button, Apple has introduced facial recognition, which it calls Face ID. It works using the TrueDepth camera system, hidden in the notch at the top of the display. Glance at the phone, and it illuminates your face, making it ready for an infrared camera to identify it. It even works in the dark. Using the A11 Bionic chip, a neural engine processes the image in real time and has been built specifically to mathematically map the shape and contours of your face. Apple claims it’s not confused by hairstyles, or whether you’re wearing a hat, or if you decide to grow a beard. According to Apple software chief Craig Federighi, the iPhone will be able to recognize your face through “most” sunglasses too, as long as they let through enough infrared light. Protections against masks and pictures are in place, and face data is stored in the secure enclave inside the A11 Bionic chip. Don’t worry about Face ID being less secure than other biometric systems; it’s not, says Apple. The chance of someone other than you unlocking your phone with Touch ID is one in 50,000, but for Face ID it’s one in a million. Apple Pay requires you to look at the phone when you go to pay, and it works with existing apps that use Touch ID for authentication. On top of that, Apple has implemented some software protections against people stealing your phone and simply holding it to your face to unlock it. For starters, if you don’t stare at the phone itself, it won’t unlock. On top of that, if you grip the buttons on both edges of the phone, the device will temporarily disable facial recognition. If you remember when Apple first implemented Touch ID, you’ll remember some bumps and bugs at first — but many of those bugs shouldn’t exist with Face ID. In fact, developers won’t even have to worry about implementing it — if an app uses Touch ID, it will automatically also use Face ID. Craig Federighi, Apple’s senior vice president of software, said as much in an interview with John Gruber on Daring Fireball. That’s good news for developers that might be worried about having to code for a new authentication system. 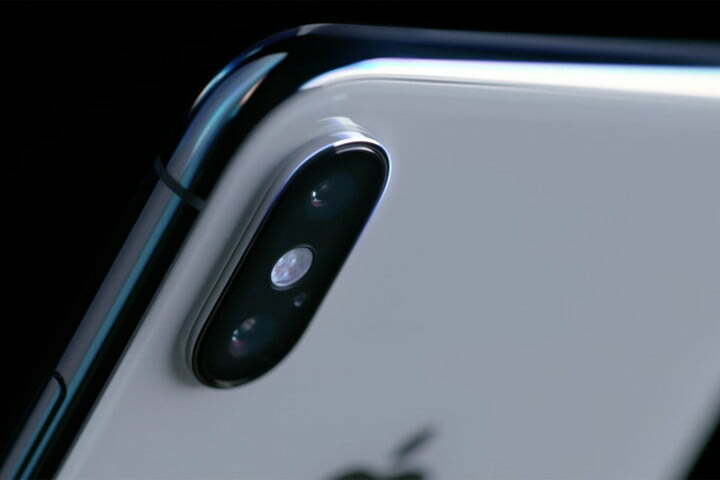 The iPhone X’s camera has a dual-lens 12-megapixel rear camera, with dual optical image stabilization, made up of a wide-angle f/1.8 aperture lens and a telephoto f/2.4 aperture lens. The 7-megapixel front camera now supports Portrait mode and has auto image stabilization and exposure control. Apple’s new image signal processor provides advanced pixel processing and a new color filter. Both cameras use the new Natural Lighting effect introduced on the iPhone 8, and the new augmented reality features. Video has also been improved with 4K resolution movies at 60fps now possible, plus slow-motion video at 240fps. The iPhone X retains the A11 Bionic chip from the iPhone 8, a 64-bit super efficient processor with a new Apple-designed graphics unit, which has 30 percent more speed than the existing unit. It has six cores, and better performance than the A10 Fusion chip. Expect the performance cores to provide a 25-percent speed increase and a 70-percent boost from the four performance cores. Inside is a battery that will deliver two hours more use than the iPhone 7 Plus and has wireless charging. Apple will introduce a wireless charging mat called AirPower to charge the phone, a set or AirPods, and an Apple Watch at the same time. The Launch may get delayed but we are waiting for it. Debut Author Pravesh Vir Siddhu’s Book ‘Nice Men Finish Last’ is Getting Great Reviews.